Pick any random home in America and chances are, you will find at least one oval braided rug under the roof. The classic oval braided rug has become synonymous with hearth and home, and every year tens of thousands of them are sold throughout the United States. The good news is that online shopping for oval braided rugs is far and away the most affordable way to go. Let’s take a closer look at this often walked upon American icon and see if we can save some money while we’re at it. What is an oval braided rug? Making an oval braided rug from scratch isn’t that different than braiding hair, although you would need Rapunzel to end up with the same kind of length you would get from an area rug. To make one of these rugs, you will need to start with at least three long strips of fabric. You then fold the edges and begin the braiding process. 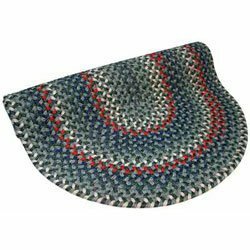 While braided rugs come in many shapes, sizes, and colors, the classic oval shaped braided rug is far and away the most popular. According to a rug-making expert, when you begin to braid an oval rug, you need to be sure that the center braid is at least one inch longer than the final width and length in feet. For example, a two foot by four foot rug would have to be two feet, two inches long. Braided rugs can come in just about any size, but the larger ones can be a bit heavy and a bit tough to move around during cleaning times. If you are a lover of oval braided rugs, chances are, you have bought more than one from your local furniture or flooring store, but what about buying tips for online shopping? Essentially, the same rules apply for online shopping, with a few changes. You need to make sure that the online store you have chosen has a good return policy just in case there is a mix up with your order, and you should also go with a highly rated online retailer who has demonstrated a commitment to quality customer service. Ask around and see if any of your friends have bought oval braided rugs online and see which seller they chose. If you have any questions, email the retailer. The promptness and quality of the response can help you determine if this is the right retailer for you. Also, stick to brand names when you first shop with an online retailer; that way, you won’t have to worry about buying an inferior product. Traditionally, oval braided rugs are made from high quality wool, but in recent years, more and more synthetic materials have been making their way into rug-making. The theory is that the synthetic material is not only less expensive, but it can often be more stain resistant, too. Many online retailers have oval braided rugs made out of a whole host of materials, so be sure you check before you buy.